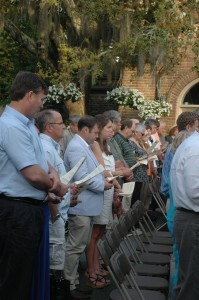 As the sun rises over Bellingrath Gardens and Home on Easter Sunday, March 27, guests are invited to come and enjoy a special Sunrise Service with friends and family on Live Oak Plaza. The service will begin at 6:30 AM and is open to everyone in the community. During the service an offering will be collected to benefit Family Promise of Coastal Alabama. Complimentary admission will be given to guests from 6 – 8 AM on Easter Sunday. A limited number of chairs will be set up and guests are encouraged to bring their own chairs. If the weather does not cooperate, the service will be held in the Magnolia Café. A breakfast will be available in the Magnolia Café from 7:30 – 9:00 AM at $9.95 for adults and $7.95 for children.